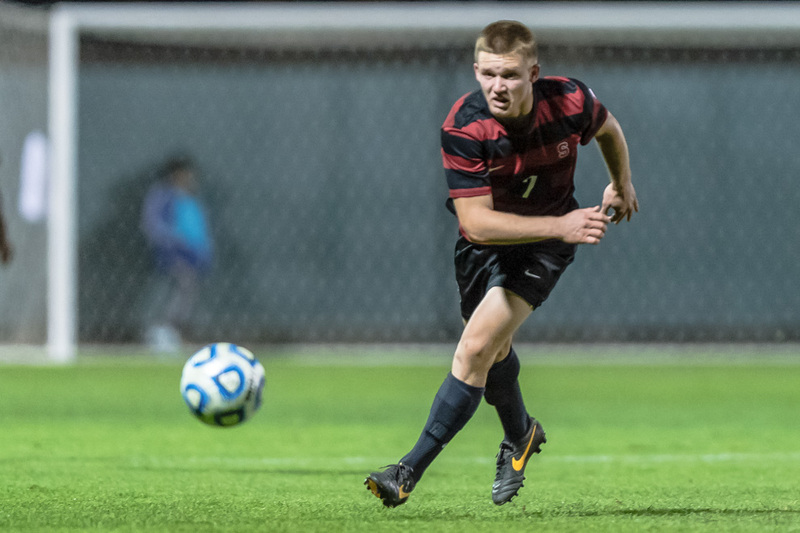 On Thursday night, the Stanford men’s soccer team travels to Corvallis to take on the Oregon State Beavers at Patrick Wayne Valley Stadium. This match is the Pac-12 opener for the newly minted No. 18 Card, as they finished out non-conference play with a 6-1-0 record. The Beavers enter the match with a 7-2-0 non-conference record, and have impressed the NCAA soccer nation enough to merit five votes in the Sept. 30 coaches’ poll (earning them a T-35th ranking). With the added pressure and importance of conference play, this promises to be a tasty affair. Stanford head coach Jeremy Gunn’s squad recently closed the book on a five-match, five-win home stand in which they outscored their opponents 13-3. This run of games included a banner win over then-No. 11 Delaware, and cemented the Cardinal’s lofty position in the rankings. All told, the Stanford men have won six matches in a row, and they will put that streak on trial come Thursday. Gunn owes much of his team’s recent success to junior Ty Thompson. While the Sacramento native’s contribution may not always be evident on the score sheet, his combination of skill and grit is invaluable on both sides of the ball. Even as a deep-lying, holding midfielder, Thompson’s style of play takes him from box to box. But, the junior knows his primary assignment lies in preventing goals. “My big job is to be one of the hard-working guys on the team who digs out balls,” Thompson said, referring to his defensive responsibilities. The junior’s ability to quell attacks eases the pressure on the back four, but also can turn into quick counter-attack opportunities. Earlier this season, Thompson memorably pick-pocketed a Delaware defender and had the initiative to run with the ball straight at the goal. He was brought down just outside the box, drawing a foul and a red card, creating a scoring opportunity for his team. “I’m always trying to score goals or create opportunities,” Thompson added. Thompson and co. will have their hands full in Corvallis, as the Beavers have yet to concede points on their home turf. Oregon State head coach Steve Simmons has guided his team to six wins in six matches at Patrick Wayne, and will rely on a formidable combination of attack and defense to tame the Cardinal. The Beavers’ traditional number 9, freshman Timmy Mueller, leads all Beavers scorers with six goals so far this year. The 6-3, 196-pound striker will look to put himself about the Cardinal defense in an attempt to find the net. Mueller will not be alone in his attacking exploits however, as eight different Beavers have found the net this year. While much of this can be attributed to their recent 11-1 humiliation of NCAA minnow Northwest Christian, the Cardinal should not underestimate the Beavers’ artillery. Oregon State will also look to senior Khiry Shelton, an attacking midfielder and playmaker who, along with notching four goals for himself, has dished out nine assists year-to-date. The Shelton-Mueller combination looks deadly on paper, but will have a tough time against an in-form Cardinal defense that kept a shutout against WCC outfit Gonzaga their last time out. Collegiate men’s soccer is physical by nature, and this match appears to be no exception. The prospect of an in-conference win will raise the stakes for both squads, and both the Beavers and the Card will look to take at least a shared place atop the Pac-12 table come the final whistle. A cursory view at the recent performances of both teams says that a flurry of goals could be on offer in Corvallis, but soccer is never that easy. Both teams might be willing to lay off the ball early and allow the game to settle before injecting some more attacking play. And once the guard is let down, the game will be on.